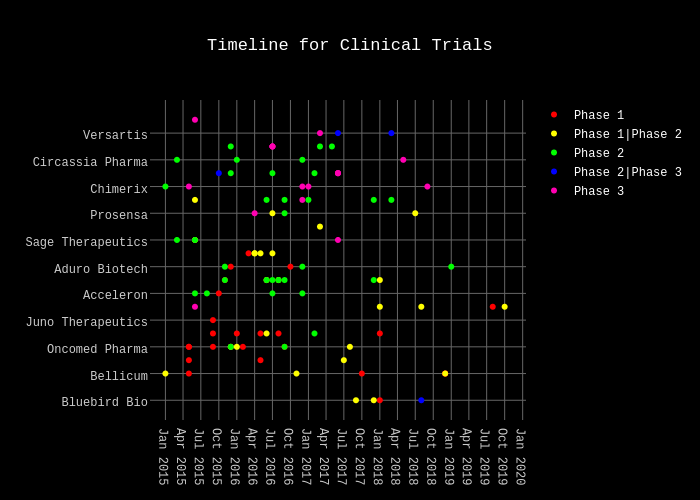 Davidskim's interactive graph and data of "Timeline for Clinical Trials" is a scatter chart, showing Phase 1, Phase 1|Phase 2, Phase 2, Phase 2|Phase 3, Phase 3; with time in the x-axis. The x-axis shows values from 1413263933152 to 1579311666848. The y-axis shows values from -1.4200695047784537 to 22.420069504778454.